Matt, what would Age of Empires IV been like? Spaceman? WWII? A reboot of the first game? I mean it'd be hard to have the whole start with a town center and 3 villagers in the modern era, and spaceman kinda crosses paths with starcraft. What do ya think? There were two schools of thought for Age IV design that I knew of - neither of which went beyond the 'sitting around a table eating cheesesteaks and talking' stage. One was from the industrial revolution through WW2 - the Atom bomb being the wonder. The other was present day through about 2200ad with a Sci-fi angle. I like the sound of the former; feels like it would have completed the series. Begins with humans at the earliest stages of civilisation, and ending with the (okay, now relatively-) modern world. oh. but yeah, whats a cheesesteak? local boi > oh. but yeah, whats a cheesesteak? Those huge bagette things look AMAZING! It's times like this I wished I was in the USA. Haha! That's a cool story. I guess the Mark I would appear in the late game? Well thats a reason for one. Only 39 more posts till 1,000! I registered just to say that I wish The Conquerors was remade... AOK 2 Expansion was the top of the series... BRING IT BACK!!!!!!!! What exactly happens when it reaches 1000? Nuclear annihilation or something nice. Tetsuo Shima: Those huge bagette things look AMAZING! It's times like this I wished I was in the USA. The stuff of fantasies and day dreams I tell you! It even sounds like it! I do, however, have food to fight back with. 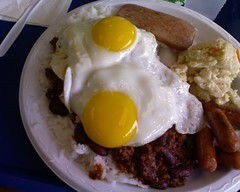 Down by the elementary school by the pond, there's a place called cafe 100; the main food is any variation on the loco moco, and I personally eat all the 3 scoops of rice, the two eggs, the tons of chili, mac salad and them smokie sausages, and spam on my plate. Can't beat that, it's cheap and good! But damn that does sound really good. And who cares about aok cheats? The real bread and butter is in the originals! The Age of Cookies expansion will be released. The new campaign will revolve around a biscuit looking for the caramel wizard. anterior2 > What exactly happens when it reaches 1000? Think of it like Kickstarter reaching a funding goal. Not implying that you're working indeed on such a thing, but don't you think the current browsergame and F2P era would be perfect for you to make the 2d AoE2-like game you wanted to create pages of pages ago? Microsoft would probably stick its nose in such idea, probably. F2P = Pay 2 win. I don't like it. I prefer the before, when I could go to a local store, pay for the game once and then have it on a DVD for whenever I want to play it! basse, I guess then you were of the minority who didn't chose to pirate one game or the other. And in no way is F2P = P2Win all the time. There are a lot of titles that are like it, but not every successful title is like that. You can love it or hate it, but it's the future (at least in short term). It's the PC gaming community's own fault to let this happen by pirating games. And there's no way anyone is go sell or play a non-F2P game in the browser, that's why I mentioned it in my question to Matt. I prefer boxed titles as well, but I find it useless to turn your backs from the future, and even more useless to bring it as an argument whether a game at it's core is good or bad. Well if that's the case, I'd well just drop RTS games altogether. I won't pay ~100 dollars, a few bucks a time, in order to enjoy a whole new game when I could pay 30 or 40 dollars for a full title in the past. No, that's just downright criminal IMO. If that's going to be the future, it's a pretty grim and unfair one. Yes indeed it is not nice looking forward the way things are going. Making more money simply because people are impatient is pretty sad, and pay to win is just crazy. I didn't even like it when like AoE3 rewarded one for time invested with the home city levelling, but at least that is more defensible. Back in the day it was all about player skill .